Unusual kitchen tips are interesting to read but do they actually work? We've tried the weirdest and wonderful cleaning hacks to find the ones that really are worth trying. Here are my top 15 cleaning tips that are sure to make your life easier. 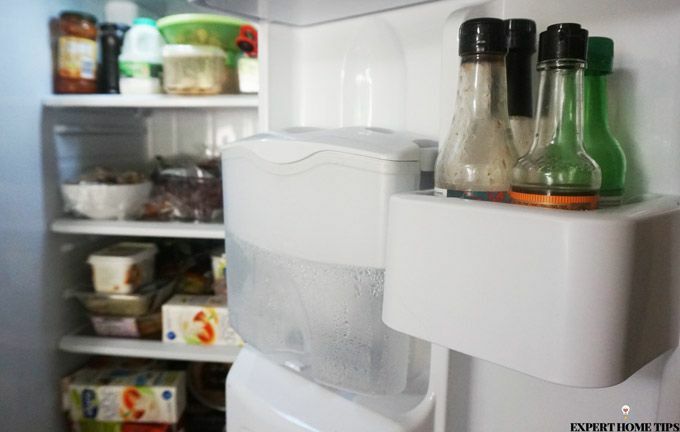 This is an amazing little trick for keeping your fridge nice and clean. Line each shelf with a layer of cling film and every week replace it with a new one. This will make it much easier to clean up any spills, leaks or food stains. If you use air conditioning in your home, it may start to smell musty and the air will feel stale. Keep it fresh by taping a dryer sheet to the front vent and leaving it on for a few hours. Tip your toaster upside down to get rid of the bulk of the crumbs then use a dry pastry brush to sweep away any of the crumbs stuck in those fiddly little crevices. Pick up a bottle ammonia from your local hardware store and some zip-lock plastic bags. Pour in 1/4 cup of ammonia into each bag with a gas burner in each then leave overnight and rinse in the morning. They'll be clean and grease-free. No effort required! This little trick has changed my kitchen chores completely! Double line your bin with black bags, the first lining will act as a protective barrier for your plastic bin and catch all the spills and gunk that may leak out of the second bag. You can change the first bag whenever you need to - it'll save you from washing and cleaning your bin as much. If you have a tiny gap where crumbs and other food particles like to settle, don't just let them live there for all eternity. Take a knife and a slightly damp cloth and pop the cloth over the gap and slide the knife from one end to the other. Check out Home Keeping for All for photo instructions. 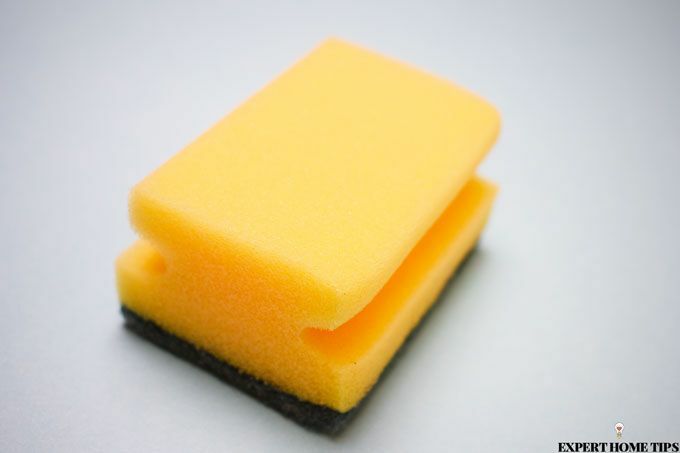 Keeping your sponge laying flat in a pool of water will encourage bacteria to breed faster. Keep it fresh and dry by using some bulldog clips to hold it upright. It'll dry quicker and last much longer than a soggy sponge. For an easy clean up, double line your trays with foil. 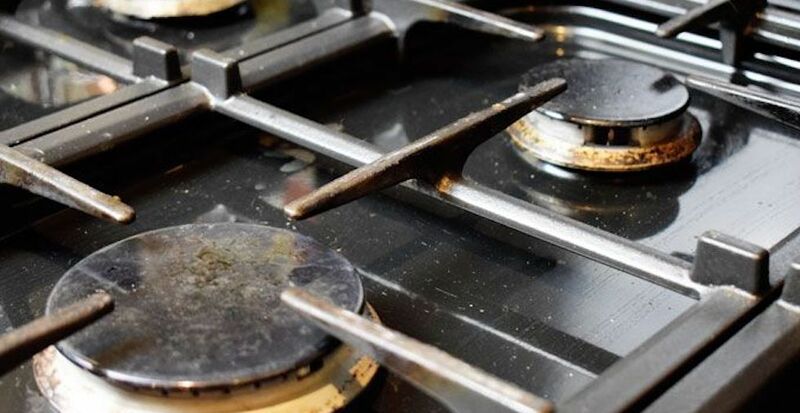 It helps prevent the oil and grease from seeping through to the pan so you won't be scrubbing away thick grease ever again. 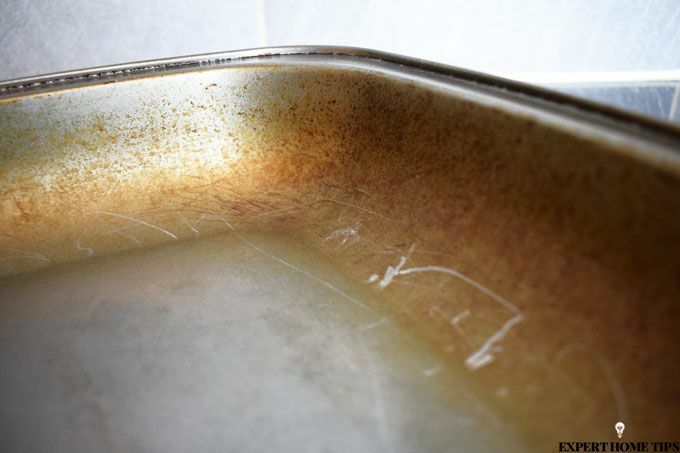 You'll go through your kitchen foil quicker, but it's guaranteed to make tray cleaning easier. For easy-peasy cleaning, blend hot water and liquid soap in your blender then rinse out. It's far less perilous than sticking your hand into the jug and sponge cleaning the blade. What colour was this before? Boil some water inside the burnt pot with some stalks of rhubarb. After three to four minutes, take the pot of the heat and let the water cool. Grab a sponge and give it a quick wipe over and the stains should lift off. Leave a bowl of water in your microwave and put it on a high heat. The steam will help lift off any stuck on food so you can use a wet sponge to clean the inside of your microwave. When you're finished, rinse your sponge and place it in the microwave and power on for a minute to get rid of any germs and bacteria that may have transferred. 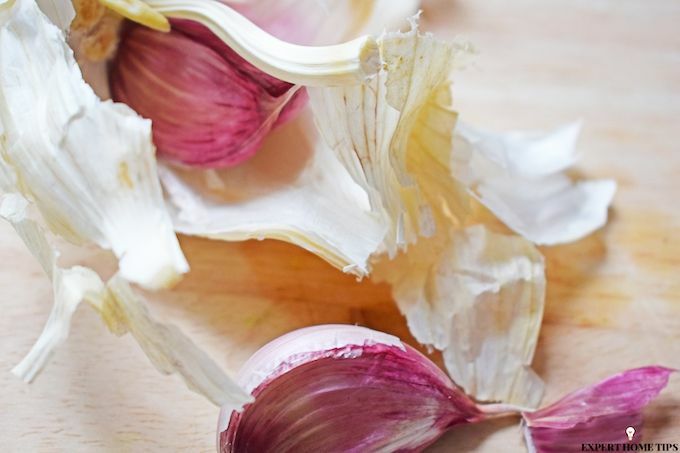 If you've been cooking strong-smelling ingredients like garlic and curry powders, get rid of any long-lasting smells by boiling a cup of distilled white vinegar and a couple of cloves in an uncovered saucepan for a few minutes. Cloves aren't the only natural ingredient that can help mask smells, there are a further 18 in Colleen's article 19 natural ways to make your home smell wonderful. Quick - grab a slice of spongy packed bread and place it over the broken glass. It acts like a magnet to pick up even the smallest shards of glass. For delicious things you can make with a loaf that is slightly past it's best, check out 11 comforting things to make with stale bread. These handy little cleaners uses high-pressure steam so you can clean almost any surface with the need for cleaning products or detergents. They swiftly remove grime in even the most awkward of places, and they're fairly compact and lightweight to boot. Clean your oven grills, tile grout, bathroom taps and shower heads effortlessly - your cleaning life will be changed forever! But don't worry, they don't cost the earth - you can get a Hoover Steam Express from Argos for just £24.99. 15. If you're in a hurry grab some baby wipes! If you've got unexpected guests coming around or you just need everything to look clean quickly, grab some baby wipes! They're fantastic at making chrome appliances sparkle (for an hour or two at least) and surfaces shine. 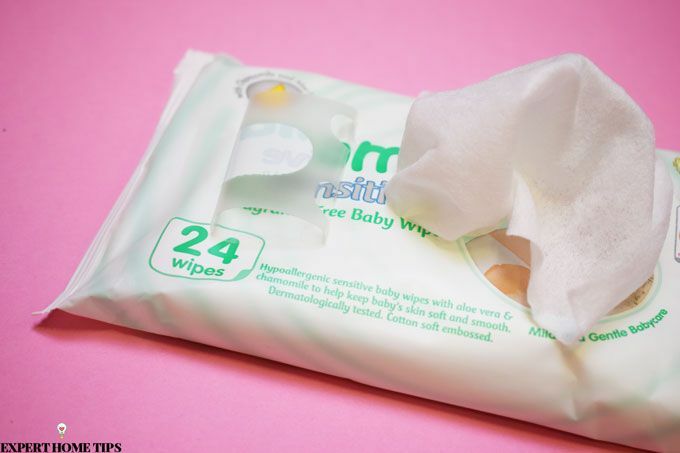 Baby wipes are a great for cleaning, check out my article 39 unexpected uses for baby wipes, and if you need to know how to clean your home in a hurry, take a look at How to speed clean your home in 30 minutes. Thanks for reading. If you enjoyed this article, please share it using the share button below! Howdo you get rid of biscuit crumbs that build up in the open joints at the bottom of biscuit boxes. The lid of the box is made of one piece of jointledd material, and on the ouitside underneath, there are no joints. Hi Elizabeth, thanks for your comment. I have the same problem with food containers! You could try sucking them out with a vacuum attachment, picking them out with a toothpick or a fine needle or with sellotape? Sorry about the spelling of some of the words. Plus I pressed the SEND button by mistake. To continue. Even with a hand held Dyson or a knife it is impossible to get rid of all these crumbs. They must constitute a health hazard as they lie there rotting.. I have asked the manufacturers to make biscuit tins seamless on the inside, but they seem more interested in the aesthetic outside look of a nice, seamless tin. I line mine with kitchen foil - it solves the problem! Fantastic Fiona. Hope it goes well! So handy to know about these very handy tips . I look forward to reading them all the time . Aww thanks Linda, that's lovely to hear. Great tip! I often clean with vinegar and while the smell lingers for a few hours, it's worth it for the finish. Forgot to mention a couple of other items I have used with some success, fresh orange peel, the citric acid in the peel is quite good for lifting grease and the rough texture of the peel acts as a mild scourer. Also, rhubarb LEAVES, normally these are discarded as they are slightly poisonous, if they are fresh, squeeze them to release the sap or, if less fresh, soak them in warm water first, either way, use the leaves as you would a cleaning cloth - a word of caution, the active ingredient is oxalic acid so use kitchen gloves and wash your hands afterwards, oxalic acid is not normally fatally poisonous unles you have a sensitivity to it but it can certainly upset the GI system. Thanks for sharing this, really very interesting. I love cleaning with rhubarb and your tip for using peel as a scourer is excellent! When double bagging the bin I always use one of the clothing bags that comes through the letterbox from these supposed charities that want your old shoes and clothes. These bags in fact come from unscrupulous eastern European gangs who think we are stupid enough to fall for their tricks. Really? I wasn't aware there were scams to do with those charity bags. Sadly, some of them are but even the legit ones have a strange idea of how many clothes I have to give away, I've had three bags from the same charity in one week, I hang them up and collect rigid plastic containers (yogurt pots etc) prior to recycling. Not a reply, as such, but a tip picked up from another customer in my local supermarket is a sure-fire way of ridding your home of marauding ants. Just combine equal quantities of icing sugar and bicarbonate of soda and scatter wherever needed. The icing sugar attracts the ants and the bicarb destroys them. This is particularly safe if you have any pets around. Hi Helen, have you tried bicarbonate of soda mixed with water? Mix 4 tbsp. of baking soda with 1/4 cup of water to make a general stain remover. Let it sit it before washing! No worries, oh good luck with that! Hi Angela, I'm sorry to hear you think that! I also use pastry brushes to clean the dust out of my computer. Just remember to run the brush along the metal case (while plugged in) to remove any static build up before you begin. Been doing this for years. They make cleaning a PC much easier. Great tip Simon. Thanks for sharing, I will be sure to try that. Hi! Really interesting tips. Will use some of them in my kitchen. Thanks for sharing. Anne. Thanks Anne!I hope they work out for you. Very american! UK don't use air con etc Why not put the gas burner frames through your dish washer (assuming you have one!) And I haven't seen citrus fruit in a net in the UK in thirty years! Hi Tim! 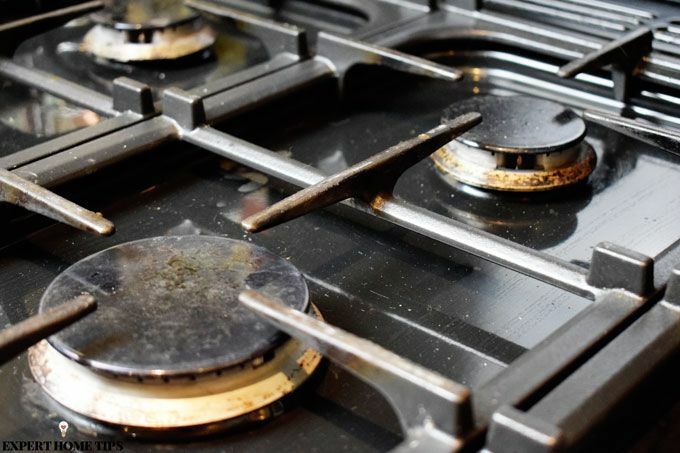 Thanks for the comments, good tip on the gas burners. I know a few people who have air con devices and I just bought a bag of easy-peelers in a net the other day. I thought they were still used? He must shop at strange grocery shops. I find fresh citrus fruit in every shop that I go to in the uk., including all of the major suppliers! Wow what an accolade! Very happy with that, thank you! I love your tips and you will always get one or more that do not agree. I find hot water soak with a powerful kitchen cleaning product can work quite well. I have found that the best way to remove burnt on food from saucepans is to boil water in them with a scoop of biological washing powder. I find washing powder is really good for any cleaning jobs in the kitchen. Thanks for sharing Jan, will have to give it a go. Hi Ron, I would use a good stain removing product, maybe something from the Vanish range? hi I have a microwave/ oven, the very back inside it has got brown stains, I have tried allsorts to get rid of them, including a lemon in water, etc, can u suggest anything to help, thanks! Hi Sejal, have you tried hot water, white vinegar and a good scourer? Simple, but effective. I don't agree with Tim's comments - citrus fruit always comes either loose or in netting - at least in the shops I go in, which range from Aldi to Sainsburys. And not everyone has a dishwasher - I don't and wouldn't want one. I use cotton buds for cleaning along grooves - get the gunk out first then dip a fresh cotton bud in bleach and run it along again. I clean round edges of my washing machine, baths, sinks and anything with books and crannys with toothpicks works a treat. Lemon juice or any citric fruit is great for cleaning bathrooms and kitchens and leaves a nice clean, fresh smell. I put the laundry/ fabric sheets on the radiators and it has the same affect as it would with an air con. Also bread is good for rubbing marks from off the walls or as a rubber. I will have to try this one out! Love your page - I use Calvin in my washing machine but it does not get rid of the black marks in the wash/conditioner drawer - any ideas for this please. Hi Chris I usually just take it out and give it a good scrub with hot water and dish cleaner. Hi I wondered how anyone can get a wet sponge to stand upright? Dry, yes but wet? Is it just me? Hi, this is a tip I have learned from my wide use of Milton Steriliser in the home. For any stained white fabric. Mix 4 tablespoons of milton solution with 1 tablespoon of washing powder. Apply direct to the stain. It will disappear and leave your whites whiter. Good tips. Some I'd not heard before. Well done for keeping it fresh. If you soak the wash/conditioner drawer of your washing machine in a sterilising solution such as Milton, & wipe It clean, then leave the drawer slightly open when not in use it will not get the black marks. I really enjoy the tips that are shared with us and disagree with Angela, I have tried so many of the tips you publish and they work really well. So thank you for sharing :) I use a pastry brush to clean out the grooves in the top of my radiators (double ones) it is so much easier. If anyone has smelly shoes or trainers that strink out the cupboard put a tumble dryer sheet in each one, it works wonders. My son has a habit of leaving the sheet in his trainers and this makes his socks smell good too. He bathes his feet in a decent after shave (not expensive) after he has a bath or shower and this soaks into his pores. He only needs to do this once a month, I think people who make trainers need to consider what they do to feet and have sympathy for our noses! Perhaps they could provide smelly fresheners :) For the lady who has found the christening dress etc, have you tried the net curtain cleaning solution you can buy? It worked well on my wedding dress when I got it back after lending it out. I managed to shift the grass stains around the bottom as well as something that looked like red wine. Good luck anyway.